Floating the ADU provides covered outdoor patio space and a storage/workshop area on the ground floor while creating better views and abundant natural light to flood the living spaces above. This project tried to make the most of a tight backyard, by providing a nice efficient, compact ADU while also giving covered outdoor space. 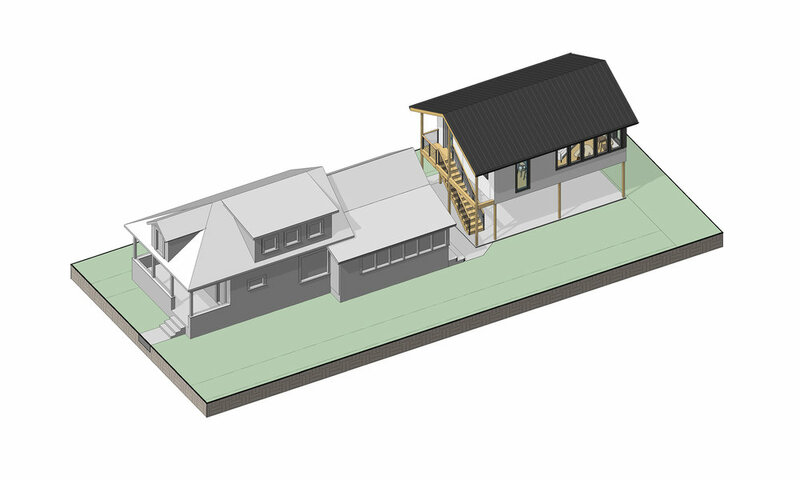 Out solution was to raise the ADU on stilts, opening up the ground level to a storage/workshop room and covered patio. This also allowed the living space to have great views over the neighborhood and to make use of natural light. Exposed structure and wood flooring bring some warmth and texture into the interior.